We’ve made it! We’re officially first time exhibitors! After months of discussions, decisions and preparations, at this precise moment you’ll find us on stand K31 at the Geo Business Show 2015 in the Business Design Centre in London. In a previous week, we discussed our approach to the exhibition and wanting to have something different that stands out without breaking the bank. The blog picture reveals our stand design; we’ve large scale canvas prints of a variety of satellite images coupled with retro items such as a globe and map bunting. We were a little worried about our stand construction, but it all seemed to go went well. Let us know what you think? In terms of promotional items, we have our brochures, postcards of all the canvas prints, a number of A5 sheets on our key products/services and our pens. 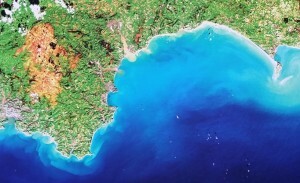 In addition, we’re giving away a small canvas Landsat image of South Devon, as shown on the right. Come on drop your business card or complete an entry form off at our stand, and we’ll select the winner tomorrow before the exhibition closes. Geo Business 2015 runs both today and tomorrow, and so do come along and have a look at our stand. Give us some feedback on our design, enter the competition or just pick up a few postcards or a pen! If you feel like it, talk to us! 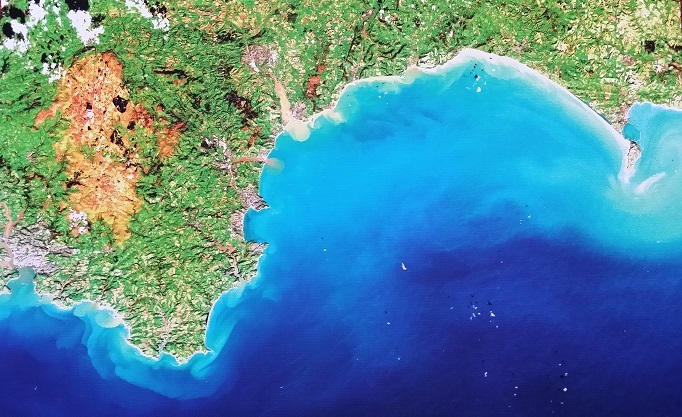 We’d be glad to discuss remote sensing, Earth observation and all things Pixalytics with you; maybe find out if there is anything we might be able to help you, or your organisation, with. Who knows what ideas, products or solutions our discussions might come up with? Don’t forget, tomorrow at 12.30pm in Room F, we’re running a free workshop called ‘How to add value to remote sensing by applying cutting edge scientific research to create richer imagery and data’. It would be great to see people there. New contacts for customers or research partners. In the next four months, gain sufficient new client business from the exhibition to cover our costs – after all this is why we are all exhibiting! Develop a long-term business relationship over the course of the next year. We’ll let you know how we got on next week. However, if you’re at Geo Business today or tomorrow why not come up and have look, talk to us and take away a few freebies. We’d love to see you. This entry was posted in Business Innovation, Data, Earth Observation, Education, Growth, Micro Business, Remote Sensing, Research, Space Can Help, Space Industry, Supporting Activities, UK Space Industry, Understanding Space and tagged adding value to remote sensing, Business Design Centre, creating richer imagery and data, cutting edge scientific knowledge, Earth Observation, Exhibitor, Free prize draw, GEO Business 2015, pixalytics, remote sensing, stand, success criteria, workshop by Andy. Bookmark the permalink.